“This year, we are meeting with the wind in our sails. All 28 Member States of the EU are growing. Since 2013, ten million jobs have been created in the European Union. We have the lowest unemployment in nine years […]. There are 233 million Europeans at work – the highest employment rate we have ever had in the European Union.” President Jean-Claude Juncker said. President Juncker and Commissioner Pierre Moscovici are attending the G20 Summit in Hamburg today and tomorrow. Under the German G20 Presidency, the G20 nations will be meeting under the motto “Shaping an interconnected world”. President Juncker and President of the European Council, Donald Tusk held a joint press conference ahead of the start of the G20 Summit. Speaking of the global economy outlook, “going back to protectionism is not the way ahead,” instead, the EU-Japan Economic Partnership Agreement, was the right way forward, adding that this agreement takes account of all European interests and high standards related to labour, environment and data protection. 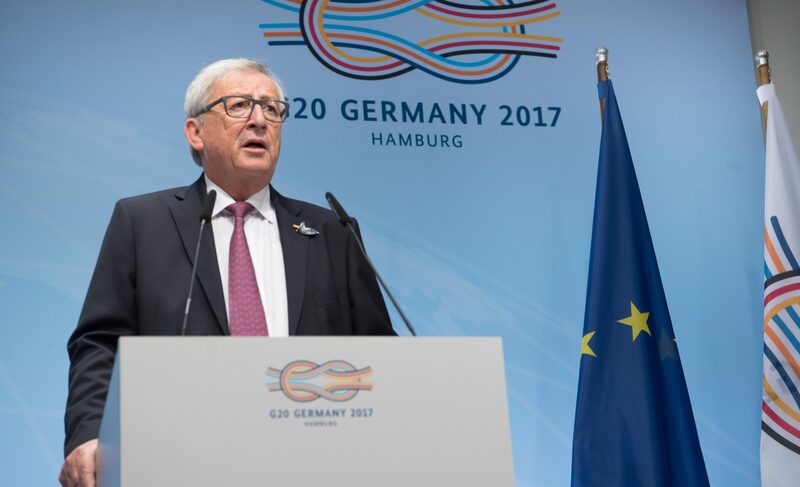 President Juncker underlined the importance of a partnership with Africa and described climate change as “the biggest challenge for the future”. Concrete G20 commitments in support of Africa are central to the Summit. Work at G20 Summit will take place in four working sessions on: 1. Global Growth and Trade; 2. Sustainable Development, Climate and Energy; 3. Partnership with Africa, Migration and Health and 4. Digitalisation, Women’s Empowerment and Employment. The EU’s priorities for the G20 Summit are outlined in the joint letter by Presidents Juncker and Tusk sent to EU Heads of State or Government on 4 July.